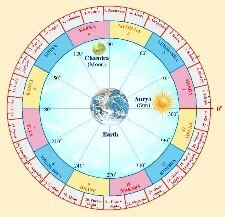 Poorvashadha Nakshatra: Spread from 13:20' up to 26"40' Dhanu Rashi. Lord is Guru, the deity is "Varun' (lord of the Waters), symbol a 'hand fan'. He has an exemplary intelligence. There is a tendency of jumping to conclusion on the matters he deals with. Nobody can defeat him in arguments. He has an extraordinary convincing power. He will not under any circumstance subdue to others, whether he is right or wrong. On one end you can have a lot of advices from him, but remember that you cannot render any advice to him. While he expresses that he is very courageous he cannot act so unless he is forced either by circumstances or by people to show the requisite courage. He is very poor in decision making and so finds it difficult to take decisions even on small matters. Once he is aroused by instigation or arguments he takes decisions without thinking the merits and demerits of such actions and sticks to that decision till the end. Even if he is completely wrong in his approach, nobody can dare change his decision. Such is the obstinate character of the native. He likes to do a lot of things for others for nothing in return, but he will be subjected to a lot of criticism. He derives maximum benefit from unknown people. He cannot keep any permanent relationship with anybody. If he works with a particular aim with full sincerity he can touch great heights in his life. He hates external show off. He is God fearing, honest, humble and far from hypocrisy. He can never think of doing anything, which will disturb the progress of others. He will be highly religious and always interested in being counted among the revered class. He will devote much of his time in puja or others religious acts. He is a good collector of antiques. He may also take interest in writing poems.